The keyword analysis tools save you time, and they all work together. Sometimes one tool will be more useful than others depending on the approach to your search. View the next three articles for details on each of the Tools AcclaimIP offers. AcclaimIP offers four ways to analyze keywords in patents. Keyword Counter --> Counts the frequency of occurrence of terms and strings in a single patent, and provides tools to construct queries. QueryFlow TermExtract (single patent) --> Ranks the "importance" of terms using a TF/IDF (term frequency/inverse document frequency) algorithm and helps construct weighted queries. 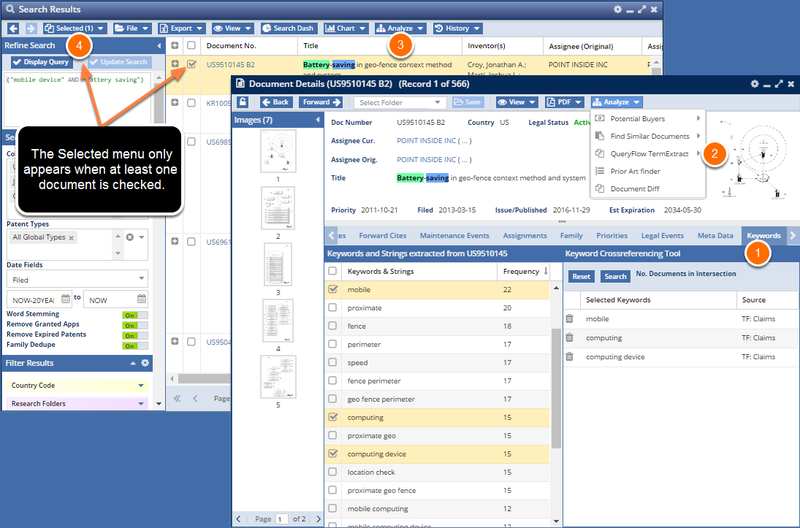 Document Clustering --> Bundles patents into multi-tiered themes from a set of up to 1000 patents. QueryFlow TermExtract (multiple patents) --> Counts important terms from a set of up to 10 different patents, counts intersections, and constructs weighted queries. The keyword analyzer tools are accessed either from the Document Details window (when analyzing a single patent) or from the Search Results window (when analyzing multiple patents). The Keyword Analyzer Tool is found in the Keywords tab (1). The QueryFlow TermExtract (for a single patent) tool (2) is located in the Document Details Analyze menu. Cluster options are found in the Search Results Analyze menu (3). QueryFlow TermExtract (for multiple patents) is found in the Selected menu (4) (only appears when at least one document is selected in the Search Results grid).